How can decomposed microservices become accessible to established service consumers? When a coarse-grained service is decomposed into multiple fine-grained microservices, previously established service consumers may no longer be able to access the same functions provided by the original coarse-grained service API. An autonomous proxy service is positioned to intercept service consumer requests and redirect them to the appropriate fine-grained microservice API. The autonomous proxy service is equipped to scale and be maintained independently of service consumers and microservices. A service proxy is positioned between the service consumers and the newly created microservices. The service proxy preserves the original API, thereby allowing the service consumers to interface with it. The service proxy contains the necessary logic to interact with the new microservices in order to provide the original logic and data back to the service consumers. 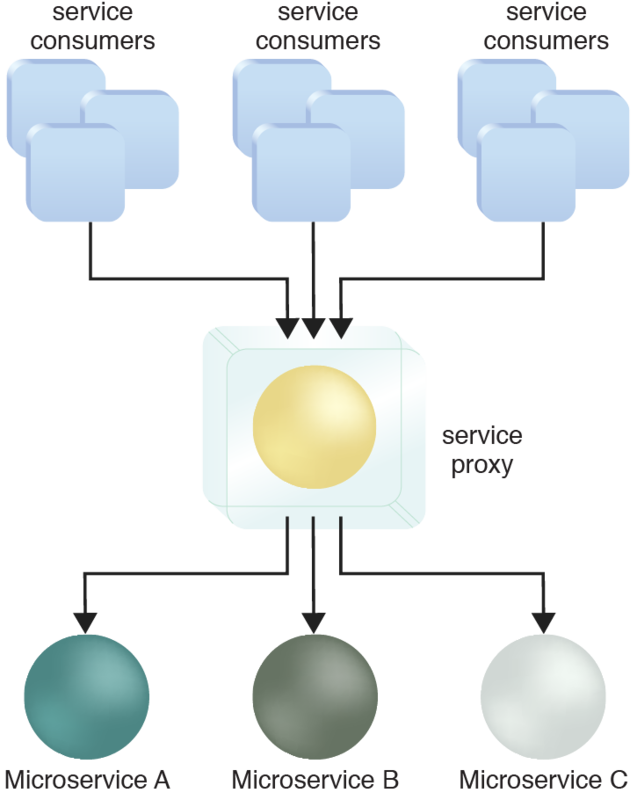 A service proxy deployed in a container relays service consumer requests to Microservices A, B and C.
Multiple instances of the proxy can be deployed and load balanced, with each proxy instance deployed in its own container and load balanced, as explained in the complete pattern description.